The largest market segment to use labeling guns still remains to be retail. Over the past decades, barcoding POS systems have obviously become common place and have reduced the use of hand held price marking. 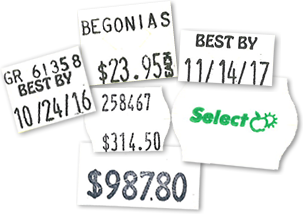 However, barcoding systems can be expensive to implement and even if one is in place, we find that shoppers like to see prices clearly marked on their items. A great advantage using price guns can offer merchants is the ability to put your store name and logo on every product you sell. Using labeling tools with custom printed labels is the most efficient and least inexpensive way to go about this. The advertising value can be a substantial as the label could stay on the product for weeks, months, and even years. Who doesn’t have a package opened; hanging above their garage work bench with a price tag still on the packaging? When your customers take products home, that little tag can re-enforce your brand and help to potentially create conversation about your store with family, friends, and neighbors. In addition to marking prices, retailers use these tools to include additional information about the product on a label. Two line label guns refer to tools that mark two lines of variable information on the label. The top line typically prints a bit smaller and is used for internal information about a product. The bottom line is used to mark the price or the second piece of information needed. Marking a cost code is a method store owners use to quickly know their cost for a product. It’s done using letters in substitute for numbers. This way, the shopper doesn’t understand what the letters mean and will simply ignore them thinking they are an item identification code of some kind. If bartering is a natural part of your business, you can quickly identify the product’s cost as to make sure you don’t go below it. Your confidence and profit margins will be stronger. Coding and item identification is very common for retailers. Anything you think might help in the organization, sale, or record keeping processes is able to be printed with no more effort than just pricing would be. One click of the hand trigger will mark all types of information. 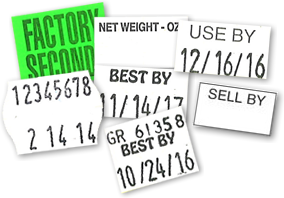 Marking a date on the label has become more popular over the years. Dates can be used to educate your customers regarding perishable food items, as well as your own knowledge for your product inventory. Preprinted phrases on the label can include Best By and USE BY followed by the variable date that the label gun would print. Perhaps you would like to mark the received date of a product so you can clearly see how long it’s been on the shelf. Click here for more information about retail and thrift shop security. Click here for more information on theft prevention in the retail industry. 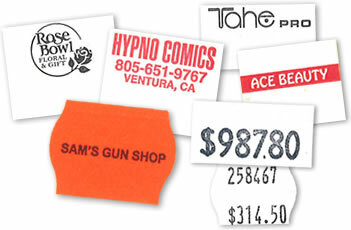 Click here for more information on price tags in the retail industry. Manufacturers of automotive parts to textiles to sealants, and everything in between, find that using labeling guns can be of great benefit to a variety of operations in the pre-production, production, and post-production processes. The labels are available in different materials and adhesive options. Labels with a synthetic material hold up very well in wet environments. Labels with a high adhesion or permanent grade adhesive will be more aggressive for tougher applications. The guns can mark one-line, two-lines, or three-lines of variable information. If you need three pieces of information to print on the label, don’t just assume you must have a three-line tool. We often find that everything will work well with a two-line label gun. It will depend on how you want everything to display, the number of characters you need for each piece of information, and label size. Custom printed wording on the labels can help to further identify each piece of information that is being marked on the label. Please call us to discuss your unique application. We can tailor a system to fit your need. You can label by marking the item itself, the box, or the master case with your product number and/or code. This can help improve product traceability all the way through to final purchase. Product of origin information can be applied for inspectors to easily see. Dating can be used for perishable products as well as for any application where a production, inspection, received on, or use by date would benefit operations. Although it’s a manual process, the labelers can be ordered with the ability to mark a time on the label as well. Most any type of code can be marked as the tools can be ordered have the ability to mark a combination of both letters and numbers. Having the ability to quickly label your inventory with the received on date can help employees quickly identify which product to use in a LIFO or FIFO operating structure. If there are any problems identifying a piece by its part number after an employee has taken it from its shelf location, a small, visible label could help. We typically try to recommend a label color that will stand out well on a majority of your items to make the label as easy to notice as possible. These labeling tools will change the number on every label or every second label. The guns can be ordered in a variety of formats to work best for your needs. Please visit our consecutive label gun section by clicking on the link to read more. Click here to view a list of the different adhesive and label material options. Click Here for a great comparison about the benefits of labeling guns vs. other methods you might use at your facility. Regulations for food safety information are being required more and more. The passing of the Food Safety Modernization Act few years ago was a broad piece of legislation and has stringent labeling and identification requirements. Inspectors are requiring that perishable products have dates. As it becomes more common, consumers are growing to expect dates on products. Therefore, it’s becoming necessary through the whole supply chain to have traceability and accountability. During your specific part of; growing, transporting, preparing, or selling, you must have an acceptable dating or coding procedure, or else a problem that you didn’t cause could be falsely blamed on your organization. Hand held labeling tools are a very simple and inexpensive solution to handle the date coding of your products. Variables such as month, day, year, and time can be marked on one line, and on the second line any type of code, employee number or initials, or another date or time can be marked as well. Up to three lines are possible with these tools. These tools make for an easy way to operate a LIFO or FIFO inventory system. When dealing with perishables in a kitchen for instance, marking a received on or use by date, or even the date with a time for the product helps provide excellent traceability that any inspector would be happy to see. Food manufacturers can use label guns to mark their items with a lot code. Should a recall be necessary, you’ll be able to quickly identify the specific products that need to be pulled. Without some form of tracing, you may end up pulling good, salable product and hurting your bottom line. Click here to view a chart that describes food prep specific adhesive options. Click Here for more information on the use of labels and label guns in the food industry. As process accountability becomes more paramount in the medical field, labeling guns have become a reliable way to quickly tag and identify items. Marking an employee identification number or initials is an excellent way to help traceability. 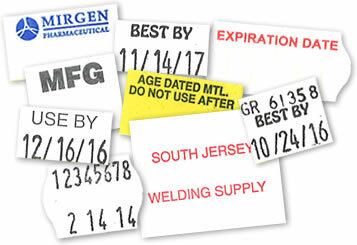 We have a variety of labels in different sizes and colors to get the most appropriate solution for your applications. Date coding is the most popular use of the guns. A tube, vial, package, or box can be simply dated with a label gun. Printing a code with both letters and numbers is also very possible. Special material and adhesive options are available for the labels. One type of special material is a high heat style label that is designed to hold up during the sterilization process. Using a labeling gun, there are two ways to go about marking information for sterilized items; before the sterilization, or after. Marking things like the date, time, employee identification or product code before would require high heat material. If marking this information after would be better, a standard paper label would work fine. In the pharmacy, having an easy way to date inventory is vital. A Received On, Use By and/or time code label which is easily visible will help decrease the chance of a product being used that shouldn’t. Most all bottles are plastic or glass, so the standard stock general purpose adhesive is the best choice. Finally, the labels themselves can be custom printed to help further identify your dates and codes. This way everyone will clearly be able to understand and distinguish one, two, three, or even four different pieces of variable information on your labels. Please call us with your questions and thoughts. 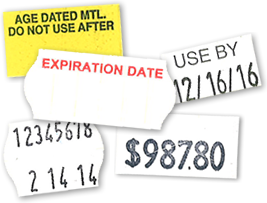 These labels are able to be applied, removed, and reapplied for inventory or book-keeping purposes. Click here for more information on the use of labels and label guns in the medical industry. We are not going to beat around the bush (yes, pun intended), sometimes agriculture applications can be tough. We have labels available in a synthetic, outdoor material that is designed to hold up against water and UV sunlight. These labels work very well, as long as they are applied when the product is clean and dry. Nothing will stick to dirt and/or water. If you have a wet process that can be changed to include drying the surface or even applying the label earlier, then the adhesive will be effective. With synthetic labels, growers are able to label the plant’s pot and not worry about the water affecting it. Product information such as price, item code, and plant name can be labeled. Some tools are available with the ability to print both letters and numbers. Bags of seeds can also be further identified with the country of origin; i.e. Product of USA. Farms that want to label bushel baskets or cases with product information find these tools to be an excellent choice because they are so portable. Popular needs of farms are the ability to label the field code, date, line code, and crew information. Really anything that helps make product tracking and accountability easier. Click here for more information on the use of labels and label guns in the agriculture industry.